Grains are the single most important food in the world. From cereals to breads of all kinds, cakes, pies, porridges; for brewing beer and other beverages or even feeding livestock. 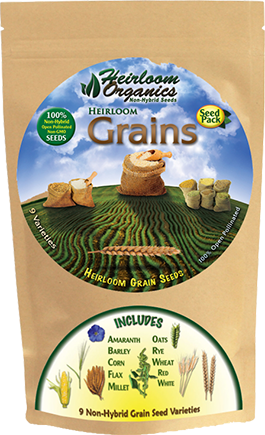 The Heirloom Organics Non-Hybrid Grains Pack provides the most nutritious and delicious original grain varieties available. A healthy selection of traditional grains, prepared with the exclusive VAULT™ method of long-term storage preparation and sealed into a reclosable green pail. The Heirloom Organics Grains Pack provides whole grains that supply vitamin E and B vitamins such as folic acid, as well as minerals like magnesium, iron, and zinc. Every sustainable garden plan should include a healthy supply of grains. Soft White Wheat is a preferred wheat for flat breads, cakes, pastries, crackers and noodles and is grown primarily in the Pacific Northwest. It has a softer, milder taste than the hard wheats. Flour from hard red wheat is considered “classic” whole wheat. While other varieties of wheat can be made into “whole wheat flour” this is the flour that gives bread a rich brown color and a nutty wheat flavor. Oats have been cultivated for near 5,000 years. Oats are nourishing as they provide starch, vitamins, minerals and proteins. They also have some amount of low saturated fat. This is why oat is considered a beneficial food item. Barley is a wonderfully versatile cereal grain with a rich nutlike flavor and an appealing chewy, pasta-like consistency. The warm, earthy and subtly nutty flavor of flaxseeds combined with an abundance of omega-3 fatty acids makes them an increasingly popular addition to the diets of many a health conscious consumer. Creamy like mashed potatoes or fluffy like rice, millet is a delicious grain that can accompany many types of food. Millet is one of the oldest foods known to humans and possibly the first cereal grain to be used for domestic purposes. Rye is one of the most reliable and easy-to-grow grains. It is most often ground into flour and used to make hearty pumpernickel and rye breads. This seed can also be broadcast under knee high corn in early summer, or simply used as a cover crop in your garden. Throughout Europe, "corn" has always been the generic name for any of the cereal grains; Europeans call corn maize, a derivative of the early American Indian word mahiz. Corn is not only a popular food, but the foundation of many by-products including bourbon, corn flour, cornmeal, corn oil, cornstarch, corn syrup, corn whiskey and laundry starch. Amaranth Grain dates back hundreds of years to the Aztecs in Mexico. It offers an unusually high quality protein and is high quality protein and is high in fiber. Amaranth Grain has a nutty flavor and can be combined with wheat flour in breads, pasta, pancakes and other recipes.